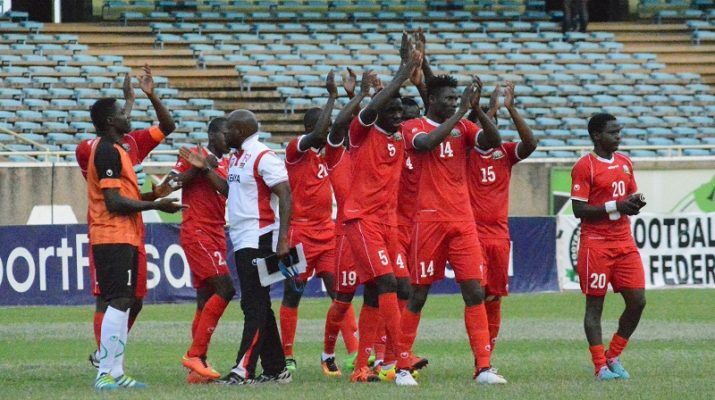 Harambee Stars Squad Named Ahead Of Sierra Leone Clash – Kenyatta University TV (KUTV). All Rights Reserved. Harambee Stars squad that will face Sierra Leone has been named. Tusker FC attacker Jackson Macharia and Sony Sugar’s Boniface Muchiri have made the cut in the Harambee Stars that will travel to Sierra Leone for the Africa Cup of Nation qualifiers. Macharia who has become a regular in Tusker squad and Muchiri a sensation winger at Sony are the only new faces in Stanley Okumbi’s line up. Masoud Juma has made a return to the team alongside Stephen Waruru, the leading Kenya Premier League scorer. Jesse Were has been omitted due to a knock picked on Tuesday evening but Michael Olunga who will train with team for the first time on Wednesday evening has been included. Eric Ouma and Eric Johanna are also among the 20 travelling members. The two were unavailable during the last international assignments as they requested to be given time to settle at their new clubs. Despite three players opting out, Gor Mahia FC still dominates the Sierra Leone bound list followed by Ulinzi Stars and Zesco United which have produced two players each. The team is expected to leave the country on Thursday.